Plants and animals interact with each other in the environment. They also interact with the environment itself. The plants and animals depend on each other. In this lesson you can learn about the interrelationships among different animals, their food habits and habitats. 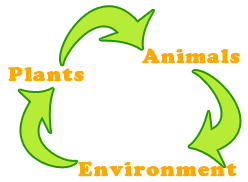 How animals depend on the environment, plants and the other animals? In the above table you can see some animals are fed on plants. Some are fed on other animals’ flesh. Some are fed on both plants and animals’ flesh. Now look at their habitats. Some live in meadows. Some live in the jungle. Some live in our homes. Some live in high elevations like rocks. 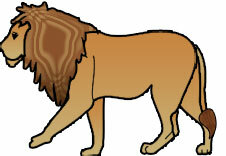 Likewise animals have a lot of relationships among other animals, plants and their environments. All animals must depend on other animals, plants and their environments to survive in this world. How plants depend on other plants, animals and the environment? Plants also depend on other plants, animals and their environments. 1) Some plants attach to another plant and grow. 2) Animals help some plants to disperse their seeds (seed dispersal). 3) Animals give plants carbon dioxide to breathe (like they give animals oxygen to breathe). 4) The environment is the habitat of plants. 5) They absorb water, mineral salt, sunlight etc. from the environment to grow. How the environment depends on animals and plants? 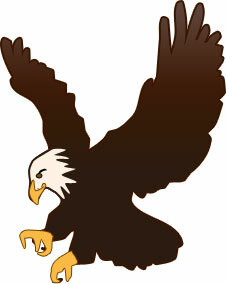 Environment is enriched with plants and animals. Dead plants and animals rot away and give energy, minerals and fertilizers to the environment. These types of relationships among plants, animals and the environment are called interrelationships. Likewise in a habitat, animals and plants are interdependent (they need each other). Without these interrelationships, we cannot think about a world with living things. All the living things are called organisms. Yes, micro-organisms are organisms, because they are living things. Habitat is a place where a plant or an animal lives. E.g. – Forests, Wetlands, Seashore, Marshes, ponds, lakes, paddy-fields, grasslands, Wasteland (a barren land), a large tree etc. 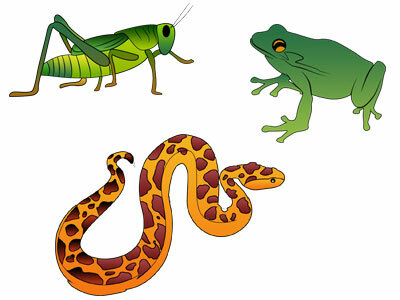 The animals and plants in one habitat are suited to live there and may not be able to survive in other habitats. E.g. – A woodland owl would not survive in a desert habitat. When a habitat changes, the animals and plants that live there are affected. E.g. – When pond weed is removed from a pond, the fish and snails that depend on the pond weed for food may find it hard to survive.